Best time to access the dome of Saint Peter's Basilica is on a sunny day. We are comparing St. Peter's Basilica with Dome Climb and Crypt Prices from leading ticket suppliers and Try to find you Cheap tickets prices on the market. This activity is a general overview of the Vatican's Basilica of Saint Peter, its premises and stunning artwork. The expert guide elaborates intriguing facts about the religious structure, its one-of-a-kind works of art and popes throughout history. The guided tour introduces all-time masterpieces, such as Bernini's "Throne of Saint Peter" and Michelangelo's "La Pieta." After the tour of the basilica's ground level, visitors climb the dome for panoramic views of Rome and colonnaded Saint Peter's Square. The guided tour ends in the underground crypt, a resting place of some high-ranking Catholic officials throughout history. Visiting the Basilica of Saint Peter is highly recommended to every visitor of Rome. Besides Christians, the believers of other religions should consider joining the activity if interested in art, history and grand architecture. Note that part of the tour takes place on the roof of the basilica, which requires visitors to overcome a long flight of stairs. Your Experience With St. Peter's Basilica with Dome Climb and Crypt? You will visit the Saint Peter's Basilica, the chief religious structure of Catholic Christianity. Visit the religious structure before official opening times. Listen to your guide as you tour the basilica, admire its opulence and hear interesting facts about its unsurpassable art pieces. 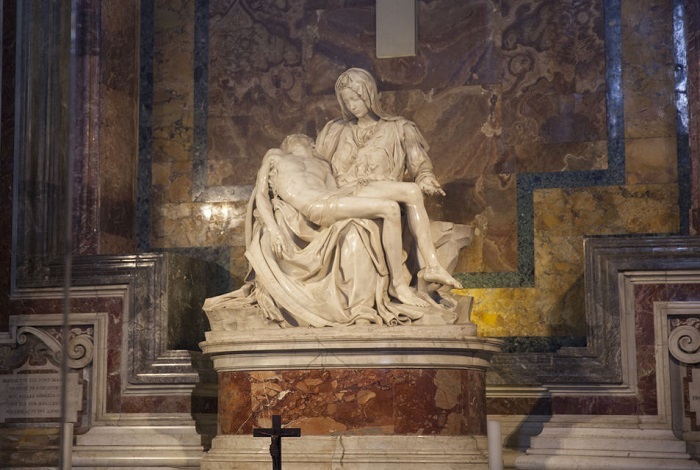 Examine "La Pieta" by Michelangelo Buonarroti and Bernini's baldachin and "The throne of Saint Peter." Take an elevator to the first level and take a flight of stairs from there to climb to the dome and enjoy great views of Rome. Descend to the crypt beneath the basilica and visit the tombs of popes. What St. Peter's Basilica with Dome Climb and Crypt Includes? Admission to the Saint Peter's Basilica before opening hours with the access to the dome and the crypt. A guided tour by an English-speaking guide. The mastermind of the fascinating dome of the Basilica of Saint Peter was Michelangelo Buonarroti, a famous sculptor, painter and architect. Among other works of art, you will see depictions of Jesus Christ, John the Baptist, Charlemagne and Constantine the Great. The design of Saint Peter's Square was inspired by an idea of the Church embracing its flock. Travelers Reviews about St. Peter's Basilica with Dome Climb and Crypt? Most travelers agree that the guided tour is an excellent investment of time and money. A number of tour participants inform that accessing Michelangelo's dome requires some effort, but the experience is worth it. According to the majority of reviewers, tour guides are knowledgeable, friendly and forthcoming. The existing reviews indicate that arriving before the opening hours and avoiding the queues builds up a great value. The guided tour isn't suitable for people suffering from disabilities. Electronic and paper tickets are valid means for joining the guided tour. Depending on the provider you choose, you receive a full refund if canceling the order 24 or 72 hours in advance. If you aren't able to walk a few hundred steps to reach the dome, you can admire views from the first level, accessible by an elevator. To be allowed to enter, dress respectfully (covered knees and shoulders). There is a bag check where you can leave large pieces of luggage. Show a valid document (ID card, passport...) to enter the religious structure.